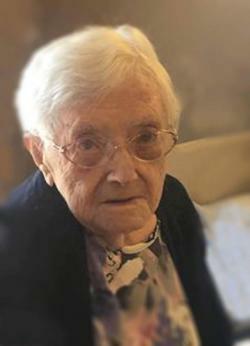 At 100 years of age, Julia Maria Noonan passed peacefully away at the Private Josiah Squibb Memorial Pavilion, Carbonear on January 8, 2019. She was predeceased by her loving husband, Eugene; her grandson, Jamie; and her daughter-in-law, Barbara. Julia was one of seven children of Thomas and Ellen Doyle of whom she was the last. Julia will be lovingly remembered by her four sons: Bernard (Catherine), Raymond, Joseph (Marguerite) and Maurice (Irene). Her beloved grandchildren: Kelly, Jody, Bernadine, Barry, Shelley, David, Sarah, Kevin, Lisa and Denise will forever miss their dear Nanny. Julia, whose family meant the world to her, also leaves 14 cherished great grandchildren: Anna and Michael Broaders, Joseph and Juila Mae Noonan, Kalan and Ava Noonan, Grace and Avery Noonan, Sophia Hynes, Austin Irvine and Noah Van Schnayk and Zoe, Hank and Levi Barnes. Julia's long, fulfilling and blessed life is a life that will be joyfully celebrated by her immediate family and by her large, extended family of nieces, nephews and cousins. We are so grateful to have had such a supportive and loving mother, grandmother and great grandmother in our lives for so long. Friends and family are invited to visit Hopkins' Funeral Home, Old Perlican on Thursday, January 10, 2019 throughout the afternoon and evening. A Funeral Mass will be held at the Parish of the Assumption, Bay de Verde at 2 o'clock on Friday, January 11, 2019 with interment to follow in the Roman Catholic Cemetery, Bay de Verde. As an expression of sympathy, donations in Julia's memory may be made to the Parish of the Assumption, Bay de Verde. At this time, the Noonan family sends a heartfelt thank you to all Julia's skilled and considerate caregivers at the Private Josiah Squibb Memorial Pavilion, Carbonear.